Today, you don’t have to live with that pain anymore. Thanks to the concerted efforts of a team of top physicians and medical engineers, the DRX 9000 was developed to effectively treat lower back pain and sciatica resulting from herniated or deteriorated discs. 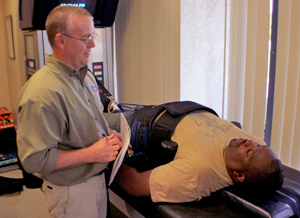 The DRX 9000 not only significantly reduces back pain in over 85% of patients, but also enables the majority of patients to return to more active lifestyles. The DRX 9000 has been proven effective in relieving the pain associated with bulging and herniated discs, degenerative disc disease, sciatica, and even relapse or failed back surgery. Since its release in 2001, clinical studies have revealed an amazing 86% success rate in treating lumbar disc related problems with the DRX 9000. 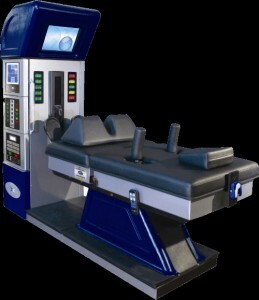 The DRX 9000 uses state of the art technology to apply a distraction force to relieve nerve compression often associated with low back pain and sciatica. Each session consists of 30-45 minutes on the DRX 9000. Following each therapy session, a cold pack and electrical muscle stimulation is applied to help the low back muscles relax. The entire program takes approximately 6 weeks. Will my insurance pay for treatment with the DRX 9000? Our experience has shown most insurance companies are paying for treatment with the DRX 9000 the same as they would for other forms of physical therapy. However, policies vary, especially for Medicare and Medicaid, so please consider having our dedicated insurance department verify your coverage in advance so that there is no ambiguity as to the coverage you will have for services in our office. Contact us to schedule an initial consultation with one of our doctors to determine if you are a candidate for treatment with the DRX 9000. After carefully studying your case history and exam findings, the doctor will sit down and explain his treatment recommendation. After answering any questions you may have about the recommended treatment plan, you may begin your treatment with the DRX 9000.